Life involves adversity: No matter what kind of career you've chosen, you're going to deal with discouragement, frustration, and situations that are, shall we say, "less than ideal." It could be a hysterical client who's demanding a refund. Or a book that gets rejected...48 times and counting. Or a job interview that goes nowhere. Or watching your best friend get the exciting promotion that you wanted. Or a vicious one-star review that rattles your self-esteem and makes you question your talent, your identity, everything. When that moment arrives, open this book. 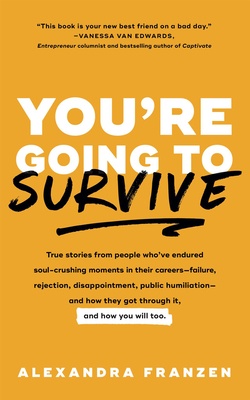 Defeat and getting through it: Inside, you'll find inspiring true stories from all kinds of people--from authors, chefs, lawyers, website designers, and Broadway performers to personal stylists, jazz musicians, business consultants, non-profit fundraisers, and more--each describing one of the worst moments in their entire career, and how they got through it. How to stay motivated and never give up: Each chapter is filled with honesty, humor, and heartfelt encouragement to help you stay motivated, keep marching, and never give up―even when things feel incredibly tough. No matter what's going on in your career right now, this isn't the end of your story. You're going to survive.